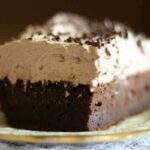 This moist, chocolate sheet cake is easy to make for birthdays, potlucks, and any time you want a quick dessert. Grease a 13x9-inch pan and set aside. Combine the cocoa, flour, baking powder, and salt in a bowl and set aside. Add egg, one at a time, and beat well after each. With mixer on low blend in 1/3 of the flour mixture. Add 1/2 the sour cream. Blend in 1/3 of the flour mixture. Add the rest of the sour cream. Stir in the remaining flour mixture. Bake for 30 to 35 minutes, or until done. Add the cream, pudding mix, and powdered sugar to the bowl of a mixer. Spread thickly on cooled cake.